On a daily basis we are greeted at around 7:30 by a warm towel and cup of tea thanks to the exemplar efforts of the kitchen staff. At around 7.48 we are greeted by the intense heat of the morning sun on our tents and crawl out of our warm sleeping bags for a breakfast in the sun with chairs socially arranged by Valdes. We go to bed wrapped in our down jackets with our headlamps on, diving into the warm comfort of our sleeping bags armed with hot water bottles. Such is life at Base Camp…… It will be good to get moving again although I think that it will be quite a shock to the system. You will have seen from Facebook and Twitter updates and in any literature on high-altitude climbing, mention of ‘weather windows’. Because of ‘weather windows’ mountains such as Makalu, Everest, Lhotse etc. can only feasibly be climbed in the spring (April / May) and in the post monsoon season (September / October), when the normally 200kph summit winds drop to between 25 - 50 kph. This drop in wind speed ultimately only takes place for about 7 - 10 days in late May, just before the arrival of the snow-bearing monsoon and variably from mid-September – mid-October. The exact dates vary from year to year. This means that climbers spend the early stages of their expeditions acclimatising / stocking up on red blood cells to prepare for the challenges ahead so that when the weather window ‘arrives’, they are ready to make the summit push and take advantage of the lower wind speeds. 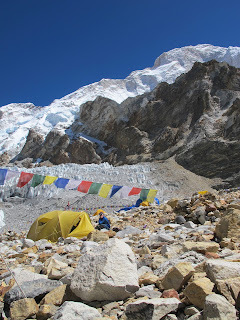 Because the ‘window’ dates vary from year to year, much time can be spent back at Base Camp / Advanced Base Camp which is used as the ‘launch pad’ for the summit. 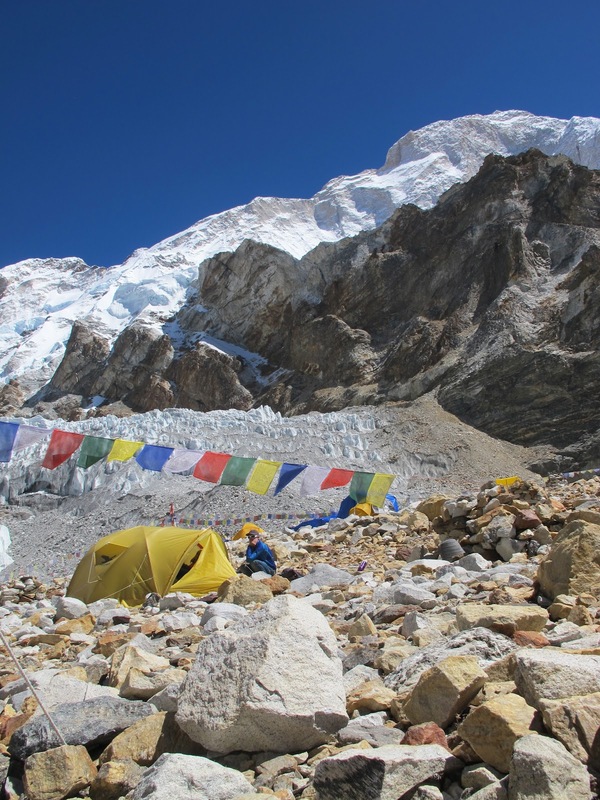 Ideally, a 7-10 day ‘rest’ at Base Camp ensures that aches and pains and coughs are tended to and that the body is repaired (as much a possible!) through a healthy combination of sleep and food. The key is to spend as little time at altitude as possible. We’ve been very lucky these past few weeks with our acclimatization in that the winds have been low and the temperatures have been mild. This morning, as predicted by the weather reports which we receive from Meteotest (located in Bern, Switzerland) the winds have definitely picked up and a very clear long and ominous plume of spindrift can be seen blowing from the ridge above camp. Change is in the air..! There are some ‘windows’ or breaks in this wind increase coming up – and until that time, all we can do is continue to sit here and wait………….. continue to raise eyebrows at Chad’s questionable taste in movies, what our neighbors are up to, where the helicopter is, and what electronic devices are in the queue for charging, whether or not it’s really, really, really time to shower….